The anxiety around Falmouth high street is not new, however the last 12 months have been harsh on it. Is the digital landscape killing the British high streets? Marks & Spencer, Henri Lloyd, Pandora the well known retailing names that have closed their stores on Falmouth high street, and the list is more likely to lengthen. That is before we count restaurants that made a decision to close down in the last year – everyone’s favourite The Kitchen, Samphire Bistro and Prezzo. What is the cause of those noticeable transformations? The rise of the digital world, popularity of online shopping or unstable economy? Today, more than half of the world’s population are connected to the internet. As a result, more and more things evaporates into the digital world, there’s no end to the excitement, debates and tragedies in the online sphere. The noisier it gets on the digital platforms, the quieter it is in the offline world. Long-established public spaces, like shopping centers, food stores, cafes and clothing shops are slowly being abandoned. Last year in Britain, 1772 shops closed their doors in the once lively town centers of the country. The decline in the number of people working in the retail industry has been noticeable since 2017, decreasing by 2.4%. However, it’s not just retail industry facing the changes, recent figures show that in 2019, pubs are closing down at a rate of 1 every 12 hours, restaurants and cafes highlight the fall in walk-ins, whilst demand for food deliveries rockets in the last couple of years. Go for a walk in the early evening through Falmouth high street, and more often then not you’ll be forgiven for thinking how eerily quiet the street is. You’ll ask yourself, where is everyone? On average Britons spend 24 hours a week online, thus going online 50 times daily, so the probable answer is that many of them are at home scrolling through their phone, chatting on messenger, flirting on various iPhone apps and enjoying this cyber-bliss lifestyle. A large number of the population have discovered that in order to get food, clothes, and sometimes even experience, they don’t have to leave the house, instead they just have to use google and have it delivered right to their doorstep. 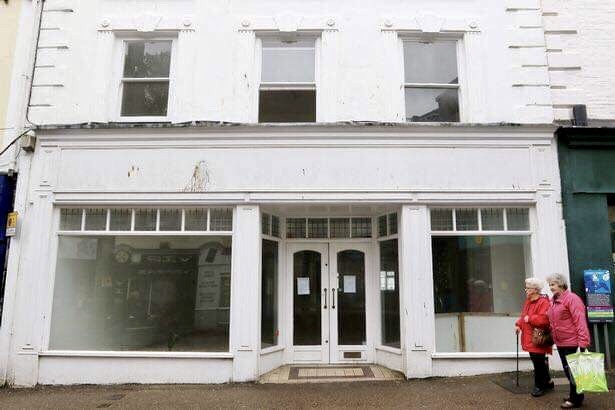 There are of course a number of other factors that contribute to the empty high street, such as high rents, inflation, lower wages, the desire of younger generation for ‘experience’ rather than things and the rise of e-commerce. Although, all of those are very relevant reasons, the simple explanation for it is that most of us prefer to spend time online, rather than in the real world, and this is having a significant impact on human lives and society. Still, the biggest issue of the high street transformation is the move to online shopping. The percentage of the population who do shop, prefer to do it online. Moreover, the UK Cards Association proclaimed that Britons buy online more, than any other nations in the world, to be precise £4,611 per person each year. Therefore, it’s not a surprise that the peak shopping time in UK at 8pm on Sunday, when we are sitting comfortably on the sofas. Amazon is a main example of how consumers prefer a cheaper and effortless method of shopping. It’s not just High Street retailers that going through tough time, traditional public meeting places have to face some adjustments as well. Sitting in a cafe another day, surrounded by multiple bodies, the place was still deathly quite, except for music that was sounding from the radio and the grinding of the coffee machine. Heads are bowed to computers, tablets, phones and no matter what noise you will make to get attention, hardly anyone will glance your way. This became evident when a local busker walked in and started chatting and entertaining people in the cafe, no one noticed a thing. It reminded me of a scene from a zombie film. Involuntary, I began to think, how our life transforms when everyday chores are redirected to the online world. What happens when social interactions move online, and the trivial offline zone becomes no more than a distraction (such as having an irritating busker trying to get your attention?). What if the high street crisis is the result of humans failing to portray the act of embodiment – being present in the moment, present with others and just being there? But is it all as gloomy as we’ve been told? I remember years ago everyone was worried that Kindle will wipe out books, and before than the debate was around television killing cinemas. However, none of this has happened. Maybe instead of focusing on what is closing down, we can drive our attention to what is staying? Maybe Falmouth doesn’t need clothing and jewellery stores and excessive amount of traditional food places? Maybe we need to wonder why healthy food cafes, art galleries and cocktails bars that delivering “extravagant’ experiences are doing better than ever before. Boots offer eye tests and you can attend Pizza Express for a live music. This all could be called era of “experience”. We live in the world where humans are interested more in purchasing “the feelings” rather than material things, as a results shops that are able to host events and provide some kind of entertainment to customers are noticing increase in revenue. A good example of such activities is Blackdog Haircutters, a hair salon that is also a venue for gigs, poets, artist, etc. This exclusive approach fascinates public for its ability to blend the sound, culture, vision and hair and as a result the place is thriving with customers. Maybe we will have to accept that some public spaces will shut down due to the modern demands of consumers. We can not get away from the fact that the internet has altered the urban landscapes and human views of the world. The high street businesses that will overcome this will be the ones that are willing to come with a new customer experience, that will make them look up from the smartphones and convince people to be present in the moment.